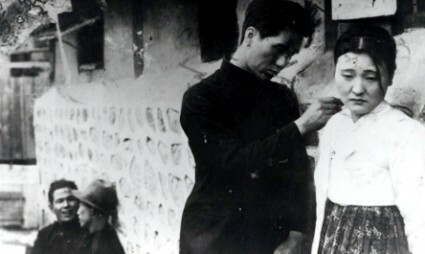 Silent films continued well into the 1930s in many Asian countries, notably China and Japan, which is why the recently-discovered oldest surviving Korean dramatic film dates from 1934, yet is a silent. It breaks Yeong-bok’s heart to leave his old mother and younger sister home to leave his hometown. He married into Bong-seon’s family and worked for seven years but when Joo Myeong-goo snatches Bong-seon away, he decides to leave town. Blaming his cursed fate for everything, he gets a job as a luggage carrier in Seoul. That is when he meets Yeong-hee who works in the vicinity. Yeong-ok also leaves home to come up to Seoul after their mother passes away but she cannot find her brother. Instead, she meets Gae-cheol, an old friend from her hometown and also a good friend of Joo Myeong-goo. Yeong-ok loses her virginity to Gae-cheol and when Yeong-bok finds out about this, he gives Gae-cheol and Myeong-goo a good beating and starts working harder for a better tomorrow. A report in The Korean Times provides some snippets of information about early Korean film, though it’s a little misleading in places. It tell us that the the oldest (dramatic) Korean film was Uilijeogguto (Fight for Justice), first screened on 27 October 1919, while the first feature-length drama was Weolha-ui Mangseo (The Vow Made below the Moon), directed by Yun Baek-nam and shown in 1923. Neither survives. The Korean Film Archive says that seven native films were produced between 1910 and 1920, and sixty-one films from 1920 to 1930, of which they hold no examples at all, while between 1930 and 1940, there were seventy-three films produced, but only five are held by the Archive. It finishes off the sorry tale by telling us that around 5,500 films (presumably dramatic films) have been produced in Korea, and some 40 percent are lost. Cheongchun’s Sipjaro beats by two years the previously oldest surviving film, Mimong (Sweet Dream) (1936), which was itself only discovered in 2005. Let’s hope for more. Update: There’s a nice piece on the film’s restoration and the work of the Korean Film Archive in this piece from JoongAng Daily.